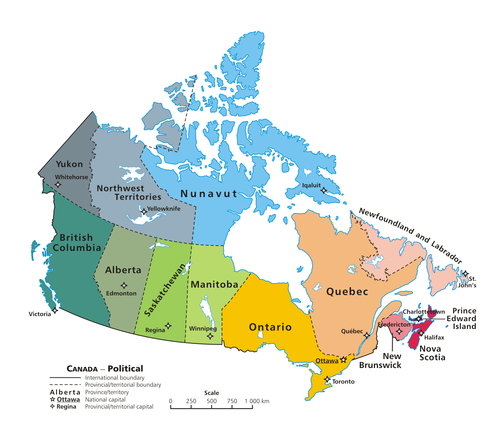 Canada, a country and sovereign state in the northern part of North America, is made up of thirteen administrative divisions: ten provinces and three territories. The different levels of government in Canada are based on the principles of a federation: those of each of the provinces and territories share power with the federal government. The territories' governments have a more limited set of powers versus the federal government than that of the provinces'. The provinces are in the south of Canada, near the border with the United States. They go from the Atlantic Ocean in the east to the Pacific Ocean in the west. The territories are to the north, where fewer people live, close to the Arctic Circle and Arctic Ocean. Here is a list of the provinces and territories, and their standard abbreviations, with their capitals (the cities where their governments are based) and largest cities. Canada's national capital, where the federal government meets, is Ottawa. This page was last changed on 20 April 2019, at 08:19.